Camping is synonymous with Western Australia, and in the summer time our favourite destination is our own South west. From Busselton to Esperance there are hundreds of family and friend orientated destinations for campers on offer. Situated 15 minutes from the small mining town of Collie is a little known - yet very popular - forest covered camping area known as honeymoon pool. It gets its name from the war days. Soldiers used to take their ladies down here to escape the stress of enlisted life - it says so on a plaque there anyway. The grounds are right on the Collie river below the Wellington dam. It's a fantastically serene area, even when it's busy the dominant sounds are distant rapids and leaves being pushed around by the wind. You can easily see why the diggers came here to relax. There is more than meets the eye about the pool though. With an adventurous spirit and a bit of creativity Honeymoon pools can be a fun filled and thrilling experience. All you need is to pack two things. The first is a body board, the second a rope. Now you may think body boarding on a river is silly yes? About 500 metres (walk or swim) upstream from the campsite is a bridge, below the bridge is a small rapid suitable for body boards and kayaks. Yes you may get a few knocks and cuts but it's a lot of fun and the freezing water quickly numbs any pain. There is no large rocks so there is no need to worry about serious injuries, just good ol' fashion carefree fun. So for the love of god stop cotton-wooling your kids and let them free, they'll love it as will you! Now for the rope. 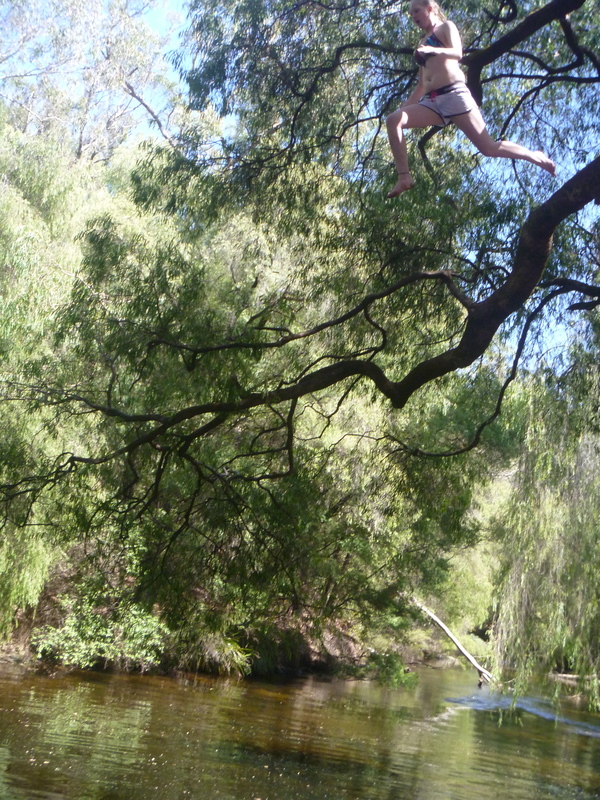 Located at the campsite is a diving platform - allowing people of all ages to dive and bombie into the deep river. This gets boring. There are trees hanging out over this platform that are much more fun to jump from. Don't worry, the river really is VERY deep! When jumping gets boring tie a rope around the tree and go rope swinging. The rangers don't like it, but every other kid in the campsite will become your best mate instantly. It seriously is a lot of fun. For the adventurous adults with a 4x4 you're in for a treat. Just over the other side of the aforementioned bridge is the Brennan track - a 4x4 only track with hair-raising hill climbs and some absolutely stunning views. You'll need a proper 4wd with good clearance and locking hubs to get to the top of the final hill climb, but the view at the top is hard to beat. The best dinner spot ever? Bushwalking is another popular activity as well as Marron and Trout fishing (in season, with licenses). At the end of the day, just relaxing in the cold waters relieves a lot of tension, and nothing in the world beats camping under the stars with no signs of the urban environment in sight. Honeymoon pool is great for those seeking to relax, and those seeking adventure. Peak season is between January to march and there is a small fee payable to maintain the provided facilities (toilets, fireplaces etc). Camping out in a 100% natural environment is something every West Aussie just has to experience. Are there ticks or leeches? You CAN NOT put a rope in the tree. There is a fine for doing so. NO DOGS ALLOWED. Price is $7 a night per adult. Also no diving from the jetty as water level changes, depending if the dam is open or not. I have been going to this place for over 20 years with my family. It is not hard to look after the place.